Ayatullāh Murťadhā Muťahharī, one of the principle architects of the new Islāmic consciousness in Iran, was born on February 2nd, 1920, in Farīmān, then a village and now a township about sixty kilometres from Mashhad, the great centre of Shī`a pilgrimage and learning in Eastern Iran. His father was Muhammad Ĥusaīn Muťahharī, a renown scholar who studied in Najaf and spent several years in Egypt and the Hijāz before returning to Farīmān. The elder Muťahharī was of a different caste of mind then his son, who in any event came to outshine him. The father was devoted to the works of the celebrated traditionalist, Mullāh Muhammad Bāqir Majlisī; whereas the son’s great hero among the Shī`a scholars of the past was the theosophist Mullā Sadrā. Nonetheless, Āyatullāh Muťahharī always retained great respect and affection for his father, who was also his first teacher, and he dedicated to him one of his most popular books, Dastān-e-Rastān (“The Epic of the Righteous”), first published in 1960, and which was later chosen as book of the year by the Iranian National Commission for UNESCO in 1965. Accordingly, the figure in Mashhad who aroused the greatest devotion in Muťahharī was Mīrzā Mahdī Shahīdī Razavī, a teacher of philosophy. But Razavī died in 1936, before Muťahharī was old enough to participate in his classes, and partly because of this reason he left Mashhad the following year to join the growing number of students congregating in the teaching institution in Qum. Thanks to the skillful stewardship of Shaykh `Abdul Karīm Hā’irī, Qum was on its way to becoming the spiritual and intellectual capital of Islāmic Iran, and Muťahharī was able to benefit there from the instruction of a wide range of scholars. He studied Fiqh and Uŝūl - the core subjects of the traditional curriculum - with Āyatul­lāh Ĥujjat Kuhkamarī, Āyatullāh Sayyid Muhammad Dāmād, Āyatullāh Sayyid Muhammad Ridhā Gulpāyagānī, and Ĥajj Sayyid Ŝadr al-Dīn as-Ŝadr. But more important than all these was Āyatullāh Burujerdī, the successor of Ĥā’irī as director of the teaching establishment in Qum. Muťahharī attended his lectures from his arrival in Qum in 1944 until his departure for Tehran in 1952, and he nourished a deep respect for him. In about 1946, Āyatullāh Khumaynī began lecturing to a small group of students that included both Muťahharī and his roommate at the Fayziya Madressah, Āyatullāh Muntazarī, on two key philosophical texts, the Asfar al-Arba`a of Mullā Ŝadra and the Sharh-e-Manzuma of Mullā Hādī Sabzwārī. Muťahharī’s participation in this group, which continued to meet until about 1951, enabled him to establish more intimate links with his teacher. Also in 1946, at the urging of Muťahharī and Muntazarī, the Āyatullāh Khumaynī taught his first formal course on Fiqh and Uŝūl, taking the chapter on rational proofs from the second volume of Akhund Khurāsānī’s Kifāyatal Uŝūl as his teaching text. Muťahharī followed his course assiduously, while still pursuing his studies of Fiqh with Āyatullāh Burūjerdī. In the first two post-war decades, Āyatullāh Khumaynī trained numer­ous students in Qum who became leaders of the Islāmic Revolution and the Islāmic Republic, such that through them (as well as directly), the imprint of his personality was visible on all the key developments of the past decade. But none among his students bore to Āyatullāh Khumaynī the same relationship of affinity as Muťahharī, an affinity to which the Āyatullāh Khumaynī himself has borne witness to. The pupil and master shared a profound attachment to all aspects of traditional scholarship, without in any way being its captive; a comprehensive vision of Islām as a total system of life and belief, with particular importance ascribed to its philosophical and mystical aspects; an absolute loyalty to the reli­gious institution, tempered by an awareness of the necessity of reform; a desire for comprehensive social and political change, accompanied by a great sense of strategy and timing; and an ability to reach out beyond the circle of the traditionally religious, and gain the attention and loyalty of the secularly educated. Among the other teachers whose influence Muťahharī was exposed in Qum, was the great exegete of the Qur’ān and philosopher, Āyatullāh Sayyid Muhammad Ĥusain Ťabā’ťabā’ī. Muťahharī participated in both Ťabāťabā’ī’s classes on the Shifā` of Abū `Alī Sīnā from 1950 to 1953, and the Thursday evening meetings that took place under his direction. The subject of these meetings was materialist philosophy, a remarkable choice for a group of traditional scholars. Muťahharī himself had first conceived a critical interest in materialist philosophy, especially Marxism, soon after embarking on the formal study of the rational sciences. Ac­cording to his own recollections, in about 1946 he began to study the Persian translations of Marxist literature published by the Tudeh party, the major Marxist organization in Iran and at that time an important force in the political scene. In addition, he read the writings of Taqī Arānī, the main theoretician of the Tudeh party, as well as Marxist publications in `Arabic emanating from Egypt. At first he had some difficulty understanding these texts because he was not acquainted with modern philosophical terminology, but with continued exertion (which included the drawing up of a synopsis of Georges Pulitzer’s Elementary Principles of Philosophy), he came to master the whole subject of materialist philosophy. This mastery made him an important contributor to Ťabā’ťabāī’s circle and later, after his move to Tehran, an effective combatant in the ideological war against Marxism and Marxist-influenced interpretations of Islām. Numerous refutations of Marxism have been essayed in the Islāmic world, both in Iran and elsewhere, but almost all of them fail to go beyond the obvious incompatibilities of Marxism with reli­gious belief and the political failures and inconsistencies of Marxist political parties. Muťahharī, by contrast, went to the philosophical roots of the matter and demonstrated with rigorous logic the contra­dictory and arbitrarily hypothetic nature of key principles of Marx­ism. His polemical writings are characterized more by intellectual than rhetorical or emotional force. However, for Muťahharī, philosophy was far more than a polemi­cal tool or intellectual discipline; it was a particular style of religios­ity, a way of understanding and formulating Islām. Muťahharī belongs, in fact, to the tradition of Shī`a philosophical concern that goes back at least as far as Nasīr ad-Dīn Ťuŝī, one of Muťahharī’s personal heroes. To say that Muťahharī’s view of Islām was philo­sophical is not to imply that he lacked spirituality or was determined to subordinate revealed dogma to philosophical interpretation and to impose philosophical terminology on all domains of religious con­cern; rather it means that he viewed the attainment of knowledge and understanding as the prime goal and benefit of religion and for that reason assigned to philosophy a certain primacy among the disciplines cultivated in the religious institution. In this he was at variance with those numerous scholars for whom Fiqh was the be-all and end-all of the curriculum, with modernists for whom philos­ophy represented a Hellenistic intrusion into the world of Islām, and with all those whom revolutionary ardour had made impatient with careful philosophical thought. The particular school of philosophy to which Muťahharī adhered was that of Mullā Ŝadra, the “sublime philosophy” (hikmat-i muta`āliya) that seeks to combine the methods of spiritual insight with those of philosophical deduction. Muťahharī was a man of tranquil and serene disposition, both in his general comportment and in his writings. Even when engaged in polemics, he was invaria­bly courteous and usually refrained from emotive and ironical word­ing. But such was his devotion to Mullā Ŝadrā that he would passionately defend him even against slight or incidental criticism, and he chose for his first grandchild - as well as for the publishing house in Qum that put out his books - the name Ŝadrā. Insofar as Ŝadrā’s school of philosophy attempts to merge the methods of inward illumination and intellectual reflection, it is not surprising that it has been subject to varying interpretations on the part of those more inclined to one method than the other. To judge from his writings, Muťahharī belonged to those for whom the intel­lectual dimension of Ŝadrā’s school was predominant; there is little of the mystical or markedly spiritual tone found in other exponents of Ŝadrā’s thought, perhaps because Muťahharī viewed his own inward experiences as irrelevant to the task of instruction in which he was engaged or even as an intimate secret he should conceal. More likely, however, this predilection for the strictly philosophical dimension of the “sublime philosophy” was an expression of Muťahharī’s own temperament and genius. In this respect, he dif­fered profoundly from his great mentor, Āyatullāh Khumaynī, many of whose political pronouncements continue to be suffused with the language and concerns of mysticism and spirituality. In 1952, Muťahharī left Qum for Tehran, where he married the daughter of Āyatullāh Rūhānī and began teaching philosophy at the Madressah Marwi, one of the principal institutions of religious learning in the capital. This was not the beginning of his teaching career, for already in Qum he had begun to teach certain subjects - logic, philosophy, theology, and Fiqh - while still a student himself. But Muťahharī seems to have become progressively impatient with the somewhat restricted atmosphere of Qum, with the factional­ism prevailing among some of the students and their teachers, and with their remoteness from the concerns of society. His own future prospects in Qum were also uncertain. In Tehran, Muťahharī found a broader and more satisfying field of religious, educational, and ultimately political activity. In 1954, he was invited to teach philosophy at the Faculty of Theology and Islāmic Sciences of Tehran University, where he taught for twenty-­two years. First the regularization of his appointment and then his promotion to professor was delayed by the jealousy of mediocre colleagues and by political considerations (for Muťahharī’s closeness to Āyatullāh Khumaynī was well known). But the presence of a figure such as Muťahharī in the secular university was significant and effective. Many men of Madressah background had come to teach in the univer­sities, and they were often of great erudition. However, almost without exception they had discarded an Islāmic worldview, together with their turbans and cloaks. Muťahharī, by contrast, came to the university as an articulate and convinced exponent of Islāmic science and wisdom, almost as an envoy of the religious institution to the secularly educated. Numerous people responded to him, as the peda­gogical powers he had first displayed in Qum now fully unfolded. In addition to building his reputation as a popular and effective university lecturer, Muťahharī participated in the activities of the numerous professional Islāmic associations (anjumanhā) that had come into being under the supervision of Mahdī Bāzārgān and Āyatullāh Taleqānī, lecturing to their doctors, engi­neers, teachers and helping to coordinate their work. A number of Muťahharī’s books in fact consist of the revised transcripts of series of lectures delivered to the Islāmic associations. Muťahharī’s wishes for a wider diffusion of religious knowledge in society and a more effective engagement of religious scholars in social affairs led him in 1960 to assume the leadership of a group of Tehran `Ulamā known as the Anjuman-e-Mahāna-yi Dīnī (“The Monthly Religious Society”). The members of this group, which included the late Āyatullāh Beheshtī, a fellow-student of Muťahharī in Qum, organized monthly public lectures designed simultaneously to demonstrate the relevance of Islām to contempo­rary concerns, and to stimulate reformist thinking among the `Ulamā. The lectures were printed under the title of Guftār-e-Māh (“Dis­course of the Month”) and proved very popular, but the government banned them in March 1963 when Āyatullāh Khumaynī began his public denunciation of the Pahlavī regime. A far more important venture in 1965 of the same kind was the foundation of the Ĥusayniya-e-Irshād, an institution in north Tehran, designed to gain the allegiance of the secularly educated young to Islām. Muťahharī was among the members of the directing board; he also lectured at the Ĥusayniya-e-Irshād and edited and contrib­uted to several of its publications. The institution was able to draw huge crowds to its functions, but this success - which without doubt exceeded the hopes of the founders, was overshadowed by a number of internal problems. One such problem was the political context of the institution’s activities, which gave rise to differing opinions on the opportuneness of going beyond reformist lecturing to political confrontation. The spoken word plays in general a more effective and immediate role in promoting revolutionary change than the written word, and it would be possible to compose an anthology of key sermons, addresses, and lectures that have carried the Islāmic Revolution of Iran forward. But the clarification of the ideological content of the revolution and its demarcation from opposing or competing schools of thought have necessarily depended on the written word, on the composition of works that expound Islāmic doctrine in systematic form, with particular attention to contemporary problems and con­cerns. In this area, Muťahharī’s contribution was unique in its volume and scope. 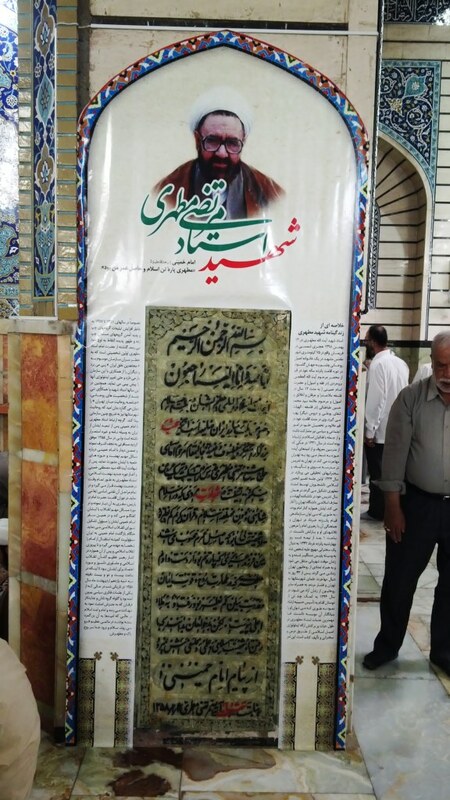 Muťahharī wrote assiduously and continuously, from his student days in Qum up to 1979 the year of his martyr­dom. Much of his output was marked by the same philosophical tone and emphasis already noted, and he probably regarded as his most important work Uŝūl-e-Falsafa wa Ravish-e-Ri’ālism (“The Principles of Philosophy and the Method of Realism”), the record of Ťabāťabāī’s discourses to the Thursday evening circle in Qum, supple­mented with Muťahharī’s comments. But he did not choose the topics of his books in accordance with personal interest or predilection, but with his perception of need; wherever a book was lacking on some vital topic of contemporary Islāmic interest, Muťahharī sought to supply it. Single handily, he set about constructing the main ele­ments of a contemporary Islāmic library. Books such as `Adl-e-Ilāhī (“Divine Justice”), Nizām-e-Ĥuquq-e-Zan dar Islām (“The System of Women’s Rights in Islām”), Mas’ala-yi Ĥijāb (“The Question of the Veil”), Ashnā’i ba `Ulūm-e-Islāmī (“An Introduction to the Islāmic Sciences”), and Muqaddima bar Jahānbīnī-yi Islāmi (“An Introduc­tion to the Worldview of Islām”) were all intended to fill a need, to contribute to an accurate and systematic understanding of Islām and the problems in the Islāmic society. These books may well come to be regarded as Muťahharī’s most lasting and important contribution to the rebirth of Islāmic Iran, but his activity also had a political dimension that admittedly subordi­nate, should not be overlooked. While a student and fledgling teacher in Qum, he had sought to instill political consciousness in his contemporaries and was particularly close to those among them who were members of the Fida’iyan-i Islām, the Militant Organization founded in 1945 by Nawwab Safawī. The Qum headquarters of the Fida’iyan was the Madrasa-yi Fayziya, where Muťahharī himself resided, and he sought in vain to prevent them from being removed from the Madressah by Āyatullāh Burūjerdī, who was resolutely set against all political confrontation with the Shah’s regime. During the struggle for the nationalization of the Iranian Oil Industry, Muťahharī sympa­thized with the efforts of Āyatullāh Kāshānī and Dr. Muhammad Musaddiq, although he criticized the latter for his adherence to secular nationalism. After his move to Tehran, Muťahharī collabo­rated with the Freedom Movement of Bāzārgān and Taleqānī, but never became one of the leading figures in the group. His first serious confrontation with the Shah’s regime came dur­ing the uprising of Khurdad 15th, 1342/June 6th, 1963, when he showed himself to be politically, as well as intellectually, a follower of Āyatullāh Khumaynī by distributing his declarations and urging sup­port for him in the sermons he gave. He was accordingly arrested and held for forty-three days. After his release, he participated actively in the various organizations that came into being to maintain the momentum that had been created by the uprising, most impor­tantly the Association of Militant Religious Scholars (Jami`a yi Ruhāniyāt-e-Mubāriz). In November 1964, Āyatullāh Khumaynī entered on his fourteen years of exile, spent first in Turkey and then in Najaf, and throughout this period Muťahharī remained in touch with Āyatullāh Khumaynī, both directly - by visits to Najaf - and indirectly. When the Islāmic Revolution approached its triumphant climax in the winter of 1978 and Āyatullāh Khumaynī left Najaf for Paris, Muťahharī was among those who travelled to Paris to meet and consult with him. His closeness to Āyatullāh Khumaynī was confirmed by his appointment to the Council of the Islāmic Revolution, the existence of which Āyatullāh Khumaynī announced on January 12th, 1979. Muťahharī’s services to the Islāmic Revolution were brutally curtailed by his assassination on May 1st, 1979. The murder was carried out by a group known as Furqān, which claimed to be the protagonists of a “progressive Islām,” one freed from the allegedly distorting influence of the religious scholars. Although Muťahharī appears to have been chairman of the Council of the Islāmic Revolu­tion at the time of his assassination, it was as a thinker and a writer that he was martyred. In 1972, Muťahharī published a book entitled `Illal-i Girayish ba Maddigarī (“Reasons for the Turn to Materialism”), an impor­tant work analyzing the historical background of materialism in Europe and Iran. During the revolution, he wrote an introduction to the eighth edition of this book, attacking distortions of the thought of Ĥafiz and Hallaj that had become fashionable in some segments of Irānian society and refuting certain materialistic interpretations of the Qur’ān. The source of the interpretations was the Furqān group, which sought to deny fundamental Qur’ānic concepts such as the divine transcendence and the reality of the hereafter. As always in such cases, Muťahharī’s tone was persuasive and solicitous, not angry or condemnatory, and he even invited a response from Furqān and other interested parties to comment on what he had written. Their only response was the gun. The threat to assassinate all who opposed them was already con­tained in the publications of Furqān, and after the publication of the new edition of `Illal-e-Girayish ba Maddigarī, Muťahharī apparently had some premonition of his martyrdom. According to the testi­mony of his son, Mujtabā, a kind of detachment from worldly concerns became visible in him; he augmented his nightly prayers and readings of the Qur’ān, and he once dreamed that he was in the presence of the Prophet (S), together with Āyatullāh Khumaynī . On Tuesday, May 1st, 1979 Muťahharī went to the house of Dr. Yadullāh Sahābī, in the company of other members of the Council of the Islāmic Revolution. At about 10:30 at night, he and another participant in the meeting, Engineer Katira`i, left Sahābī’s house. Walking by himself to an adjacent alley where the car that was to take him home was parked, Muťahharī suddenly heard an unknown voice call out to him. He looked around to see where the voice was coming from, and as he did, a bullet struck him in the head, entering beneath the right earlobe and exiting above the left eyebrow. He died almost instantly, and although he was rushed to a nearby hospi­tal, there was nothing that could be done but mourn for him. The body was left in the hospital the following day, and then on Thursday, amid wide­spread mourning, it was taken for funeral prayers first to Tehran University and then to Qum for burial, next to the grave of Shaykh `Abdul Karīm Hā’irī . Efforts are accordingly under way to promote a knowledge of Muťahharī’s writings outside the Persian-speaking world as well, and the Ministry of Islāmic Guidance has sponsored translations of his works into languages as diverse as Spanish and Malay. In a sense, however, it will be the most fitting memorial to Muťahharī if revolutionary Iran proves able to construct a polity, society, economy and culture that are authentically and integrally Islāmic. For Muťahharī’s life was oriented to a goal that transcended individual motivation, and his martyrdom was the final expression of that effacement of self. This sketch of the life and works of Āyatullāh Muťahharī is based chiefly on Muhammad Wa'izzāda Khurāsānī’s, “Sayrī dar Zindagi-yi `Ilmī wa Inqilābiīyi Ustad Shahīd Murtadhā Muťahharī,” in Yadnāma-yi Ustād Shahīd Murtadhā Muťahharī, ed. `Abdul Karīm Surūsh, Teh­ran, 1360 Sh./1981, pp. 319-380, an article rich in information on many aspects of the recent history of Islāmic Irān. Reference has also been made to Mujtabā Muťahhari, “Zindagi-yi Pidaram,” in Harakat (journal of the students at the Tehran Faculty of Theology), no. 1 (n.d.), pp. 5-16; M. Hoda, In Memory of Martyr Muťahharī, a pam­phlet published by the Ministry of Islāmic Guidance, Tehran, April, 1982; and Āyatullāh Muťahharī’s autobiographical introduction to the eighth edition of `Ilal-i Girayish ba Maddīgarī; Qum, 1357 Sh./1978, pp. 7ff. `Ilal-e-Girayish ba Maddīgarī, Page 9. `Ilal-i Girayish ba Maddigari, Page 9. The authoritative statement of this view was made by Sayyid Qutb in his Khasā’is al-Tasawwur al-Islāmī wa Muqawwimatuhu, Cairo, numer­ous editions, which was translated into Persian and had some influence on views toward philosophy. Muhahharī’s name comes ninth in a list of clerical detainees prepared by the military prosecutor’s office in June, 1963. See facsimile of the list in Dihnavi, Qiyam-e-Khunin-i 15 Khurdad 42 ba Rivāyat-e-Asnād, Tehran, 1360 Sh./1981, Page 77. Ayatollah Morteza Motahari, born 1920, received his elementary education in theology from his father, Sheikh Mohammad Hossein in his home town, Fariman in Khorasan province. When he was twelve years of age joined the Islamic Educational Center at Mashhad and pursued his studies there for five years. Then he proceeded to Qom, the great center of Islamic education. He stayed there for fifteen years and completed his education in Islamic Beliefs and Jurisprudence under the supervision of the renowned philosopher Allameh Mohammad Hossein Tabatabai, Ayatollah Khomeini and many other distinguished scholars. Then he migrated to Tehran. During the period of his education the Motahari felt that the communists wanted to change the sacred religion of Islam and destroy its spirit by mixing their atheistic views with the Islamic philosophy and interpreting the verses of the Qur'an in a materialistic manner. Communism was not the only thing which received his attention. He also wrote on exegesis of the Qur'an, philosophy, ethics, sociology, history and many other subjects. In all his writings the real object he had in view was to give replies to the objections raised by others against Islam, to prove the shortcomings of other schools of thought and to manifest the greatness of Islam. He believed that in order to prove the falsity of Marxism and other ideologies like it, it was necessary not only to comment on them in a scholarly manner but also to present the real image of Islam. Ayatollah Motahari wrote assiduously and continuously from his student days right up to 1979, the year of his assassination. He was one of the most versatile Islamic scholars and prolific writers of recent times, deeply rooted in traditional learning and enamoured of its exponents. He was a Islamic thinker who had fully absorbed a rigorous philosophical training. Much of his work has been published in and outside Iran. The activities of the Ayatollah Motahari were intolerable for the followers of some other Islamic faction, Forqan, and they, therefore, decided to remove him from the scene. Eventually they succeeded on the 1st of May 1979. When the sad news was conveyed to Ayatollah Khomeini he, in his condolence message, said: "I have been deprived of a dear son of mine. I am lamenting upon the death of one who was the fruit of my life." Ayatollah Motahary was a popular figure in the religious circles of Iran. He served in the Tehran University as the Head of the Department of Theology and Islamic Learning's. At the time of his assassination he was the president of the Constitutional Council of the Islamic Republic of Iran and a member of the Revolutionary Council.